We’d love your help. Let us know what’s wrong with this preview of Two Bobbies by Kirby Larson. During Hurricane Katrina, evacuating New Orleans residents were from Newbery award winning author Kirby Larson comes a remarkable true story of the devotion, friendship, and survival of two pets left behind in the wake of Hurricane Katrina. In the tradition of Owen and Mzee, this beautiful picture book is a testament to the spirit that defined post-Katrina rescue missions. To ask other readers questions about Two Bobbies, please sign up. Awwwwww, geez! This was enough of a tearjerker without the twist at the end! The illustrations are wonderful (and the illustrator is from New Orleans); dog and cat faces are hard to get looking "right" when you are working in a realistic style, but these are perfect, right down to the two friends' contented expressions. Animal lovers, this book is for you. I snuffled and blubbered my way through this heartwarming story about Bob Cat and a dog named Bobbi who braved the flood ravaged streets of New Orleans in the aftermath of Hurricane Katrina. They somehow survived the elements for four long months before . . . well, you'll have to read it for yourself to find out. You'll want to give your pet a hug when you're finished. I'm so, so happy I saw my friends review mentioning this. This is as lovely as it is sad. And it has a happy ending! I've found myself wondering quite a few times since watching this (we've watched it twice now in the past two days) how these two met. Were they already friends? Were they strangers who came together because they were both needed? Did Bobby pull Bobcat out of flood waters and save her life? I have so many questions, some of which can't be answered. The boss at the construction company - he allows a worker to have one dog but not two dogs and a cat? I'd be honored and proud to employ someone who sees an animal in need and doesn't turn away. Then again, why do I expect everyone to be like me? How were they left if they were owned? Bobby was tied to a porch, according to the movie, which also portrayed food left out. I honestly don't mean to judge but why did so many leave their animals? I'm sure I'll be slammed for this so let me say this upfront - no, I have never lived through something like Hurricane Katrina. Yes, I do think I know myself well enough to say, with a degree of certainty, what I'd do in 'x' situation. I'd put my dog on my back and swim through filthy floodwater - against the tide - if I had to. I'd swim back for more if need be. Basically I would do whatever was necessary to get my animal(s) out. I'd do whatever was necessary to get anyone's animals out. I dare say I'd do some 'unethical' things if need be. Obviously there are things to be considered - maybe a pet owner was elderly, injured, etc. Okay. But it seems there were a lot of the able-bodied people leaving their animals behind as well. Another thing I want to mention that will hopefully make someone out there think - why is it that when an animal lives through something like this or does something heroic - and is profiled on t.v./the newspaper - that everyone and their mom wants to adopt them? Do these people not know about the bursting to capacity animal shelters right down the street from every single one of them? Do they know the term 'high-hill shelter'? That bothers me to no end. It's also worth pointing out that the authors noted how hundreds of people applied to adopt both Bobbies. One woman got in her car and drove through however many states to meet the two Bobbies. One. As far as I know she had no assurance she'd leave with these animals. Yet she went. None of the others did. I suppose both Bobbies should have been hand delivered to them. In short, most humans make me sick. We read the book a few days after we watched the movie. The book goes hand-in-hand with the movie. They can go together or they can can be enjoyed separately. "Enjoy" is a strange word to use I guess but there's a happy ending for these two, not to mention their new owner, so I'll keep it. 7-10.The heartwarming true story of the unlikely friendship between Bobbie the dog and Bob Cat the cat and their survival following Hurricane Katrina. The two are peas in a pod, and both without tails. Although likely embellished at times (because who knows the real truth), they are inseparable following the storm and roam the streets of New Orleans for several months because getting rescued by a construction worker who brings them to a shelter. Bobbie was chained during the storm, the 7-10.The heartwarming true story of the unlikely friendship between Bobbie the dog and Bob Cat the cat and their survival following Hurricane Katrina. The two are peas in a pod, and both without tails. I am an absolute sucker for these across animal species friendship stories! Checking it out for my boys. A story of a cat and dog who survive Hurricane Katrina together. Four months later a worker on a construction crew begins feeding them. He trims the dogs chain, but leaves some because the cat seems to like following it. After feeding them for a week, his boss tells him that he has to get rid of them. The dog won't let him touch the cat, but he lures them in the van with food. He takes them to I am an absolute sucker for these across animal species friendship stories! Checking it out for my boys. Recommends it for: any animal lover, any child who has a disability or knows one with a disability. This charming story of interspecies friendship is a keeper. The cat and dog both survived Katrina after being abandoned by their owners. Eventually they were taken to a shelter and separated. Both animals threw fits. Finally they put them back together. After watching them together, they realized the cat was blind and the dog guided and protected the cat. Both, btw had bobbed tails which inspired their names. So, you know it is a great book when reading it aloud to fourth grade, and you realize you are tearing up. And then you look up at the class and see a lot of red, teary eyes looking back at you. We all made it through and then talked about how we love our pets and how hard it had to be to leave them behind. A cat and dog separated from their owners help each other survive after Hurricane Katrina. As a librarian, I frequently read picture books. Once in several years, I will read a picture book that I just have to buy in spite of the fact that I have no small children. This book is one that I must have. Two Bobbies, is a wonderful TRUE story that touches people of all ages. Two Bobbies is a wonderful true story that belongs on the top shelf of your humane education bookshelf. The “Two Bobbies” are Bobbi, a dog, and Bob Cat, a cat, so named for their “bobbed” tails. The animals had been left homeless by Hurricane Katrina and had been roaming the devastated streets of New Orleans for an unknown period of time before being discovered and rescued. People who encountered the two were amazed by their devotion to each other—Bob Cat followed Bobbi everywhere, and Bobbi was Two Bobbies is a wonderful true story that belongs on the top shelf of your humane education bookshelf. The “Two Bobbies” are Bobbi, a dog, and Bob Cat, a cat, so named for their “bobbed” tails. The animals had been left homeless by Hurricane Katrina and had been roaming the devastated streets of New Orleans for an unknown period of time before being discovered and rescued. People who encountered the two were amazed by their devotion to each other—Bob Cat followed Bobbi everywhere, and Bobbi was so protective she would not let anyone touch the feline. At an emergency shelter set up by Best Friends Animal Sanctuary, rescuers made an amazing discovery—Bob Cat was blind, and Bobbi was acting as his “seeing eye dog”! There are a lot of great “teachable moments” within this book. The issue of Hurricane Katrina is depicted sensitively so as not to upset, but the illustrations and text still make it clear that pets, as well as people, are affected by natural disasters. Hurricane Katrina was, indeed, a turning point for America after emergency personnel forbade residents to evacuate with their pets—and mainstream culture finally realized the intrinsic problems with this cruel policy. Also, we see firsthand a delightful example of animal emotions and inter-species friendship. I purchased this book for my library. This is a wonderful story, at times heartwrenching, but overall, a tender story of love, companionship and survival. The story illustrates to a small extent how many beloved pets suffered greatly during the Hurricane Katrina disaster. So many pet owners were devastated to leave their pets behind, and some refused to evacuate without them, choosing to brave the flood rather than desert them. This event changed the perspective of rescuing organizations, to the point that when I attended a class on This is a wonderful story, at times heartwrenching, but overall, a tender story of love, companionship and survival. The story illustrates to a small extent how many beloved pets suffered greatly during the Hurricane Katrina disaster. So many pet owners were devastated to leave their pets behind, and some refused to evacuate without them, choosing to brave the flood rather than desert them. This event changed the perspective of rescuing organizations, to the point that when I attended a class on coordinating domestic relief actions in 2009, the U.S. policy had changed to accomodate pets with their owners to the greatest extent possible, within reason. This is the SWEETEST book ever about a dog and cat abandoned after New Orleans was evacuated for Hurricane Katrina. The dog and cat are BEST friends, and the dogs loyalty had my heart swelling and my eyes tearing. A beautiful story of friendship and survival. Bob Cat and Bobbi Dog travel together after being stranded from Hurricane Katrina. Depending on each other, neither might not have survived the aftermath without the other, and the kindness of strangers. I love this story! My students loved this story! It is based on a true story of a cat and dog who are abandoned after Hurricane Katrina. If you can read this book without getting a huge lump in your throat-you're tougher than me. Had I heard of these two at the time, I'd have been tempted to adopt them myself! An unusual, sad story with, fortunately, a very happy ending. Animal lovers everywhere will love this book! A lovely story. I shared this book with two classes and everyone enjoyed it. Read it, it will give you hope with the human experience. Children's authors have commonly found that the only way to really write about a huge recent disaster for small tykes without irreparably scarring them for life is to find some kind of human-interest story to focus on. When 9/11 happened it was The Man Who Walked Between the Towers that ended up being the best picture book to make reference to the tragedy, and it didn't even talk about it all that much! Similar books like Fireboat and September Roses made their focus a boat and a delivery of flo Children's authors have commonly found that the only way to really write about a huge recent disaster for small tykes without irreparably scarring them for life is to find some kind of human-interest story to focus on. When 9/11 happened it was The Man Who Walked Between the Towers that ended up being the best picture book to make reference to the tragedy, and it didn't even talk about it all that much! Similar books like Fireboat and September Roses made their focus a boat and a delivery of flowers but somehow neither really twanged the heartstrings effectively. What's particularly interesting about these three books is that none of them involved animals in any way. Critters were few and far between around the Twin Towers that day. As a result, authors had to scramble especially hard to find something, ANYTHING, to that kids could relate to. Newbery Honor winning author Kirby Larson and her partner in crime Mary Nethery have it a little easier. Focusing on an animal interest story from the time of Hurricane Katrina, Larson and Nethery could have easily phoned in the tale of Bob Cat and Bobbi, but the story that emerges here is one of grace and delicacy. Steady hands present us with the story of this cat and dog team. It is an actually touching story, with none of the faux emotions or cloying techniques sometimes employed with lesser true-life dog/cat tales. They were abandoned like many pets when their human owners evacuated New Orleans in the wake of Hurricane Katrina. A dog with a bobbed tail and a cat, also with a bobbed tail, the two stayed close together in the time that followed. Fighting starvation and thirst, they walked the streets trying to find sustenance. A kind construction worker fed them, and in time the two were taken to a nearby shelter where they were named Bob Cat and Bobbi. To the surprise of the workers there the two did not want to be parted. Stranger still, it was determined that Bob Cat was completely blind. When no one adopted them their story was told on Anderson Cooper's 360 and they found a new owner with a ranch and other dogs. There the two have stayed every since. A note at the back of the book includes a photograph of the real Bobbi and Bob Cat. There have been quite a few inter-species friendship stories that have fared well as children's books. Koko's Kitten, the tale of a gorilla and her pet cats, was one of the earliest. More recently there was Owen Mzee, in which a baby hippo was "adopted", in a sense, by an old tortoise. These stories inevitably involve tragedy (dead kittens, dead mothers, etc. ), making them ideal subject matter for the author's pen. So I admit to being a little surprised that only Larson and Nethery had the wherewithal, after seeing the Anderson Cooper 360 piece, to realize that this was picture book heaven. Jeanette Winter must've been napping that day. Newbery Honor winning author or not, human interest stories done as picture books can still fall flat if their accompanying illustrator is less than great. I can just imagine the discussions surrounding what kind of illustrator would work on Two Bobbies. Would they go with someone with a cartoony style? Someone who would, in a way, make the material younger and more small-child-appropriate? Or what if they found enough actual photographs of the real Bobbies and told the story that way? Grounding it in truth, if you will. Of course, the problem with that style is that Larson and Nethery begin their story long before any photographer thought to take a picture of the two pets. You'd have to make up for it in creative, questionable ways instead. The solution appeared to be somewhere between the two of these styles. Realistic illustrations would fill in many of the gaps in the Bobbies' past. Enter Jean Cassels, an illustrator prone to drawing more than sixty nonfiction nature titles. Best of all, Cassels is a New Orleans native, one who took her husband and her three dogs out of the city a mere day before Katrina hit. Cassels' style fits the story nicely. Once you hit the big reveal that Bob Cat has been blind all along, you can go back to the images and see that this makes a certain amount of sense. Pictures of Bob Cat show him placing one paw carefully in front of himself at all times, testing the ground in front of him. Other images of him show that he never looks at Bobbi. Not directly. Now there were times when I wondered about the factual leaps taken by the story. I suppose Cassels, Larson and Nethery felt inclined to draw some conclusions from this tale. For instance, they seem to believe that Bob Cat and Bobbi were together from the start. We don't actually know that they were owned by the same people at the beginning, but it's something that seems natural to assume, given how close the two were. A story of a dog befriending a blind cat in the midst of a hurricane is a whole different kettle of fish anyway. Cassels then draws the kind of house they might have lived in, which is sketchy territory. Other stretches of the imagination don't bother me as much. The pair being snapped at by other abandoned animals or their wait on the porch of their home while the water recedes, both leaps in logic sound about right. You have to make some basic assumptions if you want to render this a fully fleshed out tale. I just think great care must be taken when we render supposition to be fact, particularly when we're dealing with four-year-old audiences. Hurricane Katrina has lent itself to few changes in my library's children's collection. We've upped the number of hurricane books (and I suspect that the coming years guarantee that to be a sound investment) but those that actually discuss the hurricane itself are few and far between. How do you inform small children about government failure, loss of homes and lives, and general chaos? Cute animals can help, but only if their stories are real and (harder still) interesting. Two Bobbies hits all the right notes without falling too far into the realm of assumption and speculation. A great tale in general for cat people, dog people, and we-want-our-kids-to-read-great-books people. Larson, Kirby and Mary Nethery Two Bobbies: A true story of Hurricane Katrina, friendship and survival, illustrated by Jean Cassels. Walker (Bloomsbury), 2008. After Hurricane Katrina, a cat and a dog were found starving and wandering together through the debris. Their rescuers discovered a special secret about the pair and only a very special family would be the right kind of home for this pair. 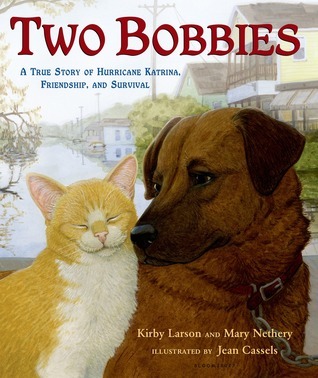 Communities affected by Hurricane Katrina will appreciate this story of hope, but animal lovers of a Larson, Kirby and Mary Nethery Two Bobbies: A true story of Hurricane Katrina, friendship and survival, illustrated by Jean Cassels. Walker (Bloomsbury), 2008. After Hurricane Katrina, a cat and a dog were found starving and wandering together through the debris. Their rescuers discovered a special secret about the pair and only a very special family would be the right kind of home for this pair. Communities affected by Hurricane Katrina will appreciate this story of hope, but animal lovers of all ages will also be touched the two bobbies tale. This book is the very touching tale of two house pets who survive Hurricane Katrina in New Orleans. They must survive, using each other as resources. The most amazing part of this story is that it is a true one! In my class, I would use this story as a read aloud to model the Herringbone framework. This story leaves lots of opportunities for questions (who, what, when, how, why, where) that students could practice answering to discover the main idea. I would also use this story to discuss weathe This book is the very touching tale of two house pets who survive Hurricane Katrina in New Orleans. They must survive, using each other as resources. The most amazing part of this story is that it is a true one! In my class, I would use this story as a read aloud to model the Herringbone framework. This story leaves lots of opportunities for questions (who, what, when, how, why, where) that students could practice answering to discover the main idea. I would also use this story to discuss weather and the effect of natural occurring phenomenas (like hurricanes) on our society. This could lead to students constructing their own stories about the effects of weather on our cities and states. SUMMARY: This book is about two unlikely friends. A cat and a dog that share a bond over being deserted by Hurricane Katrina. The cat is named Bob Cat and the dog is named Bobbie. They both seem to have no tails. These two animals are left to fend for themselves after their family desert them when the disaster hits. They then wonder around the city looking for shelter and food to try to survive. They get send to Best Friends Animal Shelter in the hopes of being adopted by a loving family. CRITIQUE: This book follows the literary guidelines. The plot is universal. There is a conflict between the main characters and nature. The cat and dog are faced to try to survive on their own after the natural disaster. The point of view of this book is very unique. Most people only think about the poor families that lost their homes in this tragedy. This book shows how the abandoned pets had to live the rest of their lives trying to scramble up food without a family. The characters are developed through what they have to go through in the story. The cat and dog grow a stronger bond with each other because they need one another to survive. This is very evident when we find out at the end of the book the cat was actually blind. SO all that time the dog was essentially "her eyes".The language of the book is skillfully crafted. It gives some background to New Orleans to give children a background in what the place is like before reading the story. The diction is easily understandable and read by children. The illustrations communicate symbolically especially in the beginning of the book. You can see the sadness and desperation is the animals' eyes as they begin their journey to a new life. It also communicates literally on the page with the flooding. That is an eye opening to many children because they probably haven't been exposed to pictures like that. The text and illustrations compliment and enhance each other. The main part was when the book was describing how hungry and starved the animals were. In the illustrations you could see the rib cage on Bobbie and the color starting to strip from Bob Cats fur. The tale of a friendship between a cat and a dog. A friendship forged and fortified through sacrifice and trials. Many pets became dislocated and separated from the families in the aftermath of Hurricane Katrina. So many never found their home. We get to experience the story of the Two Bobbies, and how they survived through the long days after the storm had passed, with no loving family to watch over them. It's a tale of survival and hope. This is the true story of a cat and a dog who lived in New Orleans during Hurricane Katrina. They are named Bobbi and Bob Cat because neither of them have a tail. Throughout the storm, they stay together through the winds and rain. Once the storm is over, they wander the streets searching for food and clean water. One day, a construction worker notices them and starts to feed them, but each time he tries to pet Bob Cat, Bobbi growls at him. Eventually, his boss tells him that he cannot have an extra cat and dog on the work site, so he takes them to a shelter where volunteers discover that Bob Cat is actually blind and Bobbi is his seeing eye dog! When the shelter closes, they are still left without owners, so the volunteers put the two on a television show. Several people call wanting to adopt the pair, but Melinda, a woman with two Boston Terriers, is found to be the best match. In the end, Bobbi and Bob Cat find their forever home and get to stay together. The illustrations in this book are very realistic, which is helpful since it is a true story. They show what is happening in the story very well. Even the end pages are helpful because they show Bobbi and Bob Cat looking out a window and a radar-like view of Hurricane Katrina. This helps set the stage for what happens throughout the story. There is also a photograph of the "Two Bobbis" at the end of the book, which would help students make the connection between the illustrated animals and the real ones. In New Orleans in 2005, people were forced to leave their homes because of Hurricane Katrina. Many were forced to leave behind their pets, including the owner of Bobbi (the dog) and Bob Cat. With all of the help after the storm rescuing both people and animals, they still missed the Two Bobbies. With all of their food and drink gone, Bobbi broke free and Bob Cat followed by her side to go find food and water. There were angry mobs of homeless dogs that would chase away the smaller animals and t In New Orleans in 2005, people were forced to leave their homes because of Hurricane Katrina. Many were forced to leave behind their pets, including the owner of Bobbi (the dog) and Bob Cat. With all of the help after the storm rescuing both people and animals, they still missed the Two Bobbies. With all of their food and drink gone, Bobbi broke free and Bob Cat followed by her side to go find food and water. There were angry mobs of homeless dogs that would chase away the smaller animals and the Two Bobbies were in danger. Their ribs started to show from the lack of food. A worker at a job site started to help the Two Bobbies, but was told he was not allowed by his boss. The animals were placed into a shelter and had to be housed together because they made too much noise when they were away from each other. They found out that Bob Cat was blind and Bobbi was her seeing eye dog. The shelter closed down later and they were transferred to another shelter in Utah. There, Melinda made a trip with her Boston Terrier, Gus Gus to meet the Two Bobbies and they instantly fell in love with one-another. They now live with Melinda and her two Boston Terriers in Southern Oregon. I like the plot of this book because it shows that although the animals were lost, they were found and placed in a safe, happy home. It has a happy ending that shows that no matter how bad things are, it will always get better. There is always hope. I would use this in my classroom in science where the students can do research on hurricanes and other natural disasters. I could use this with a text set with other nonfiction texts to educate students on what can happen around the world. I could also have the students pick a natural disaster and do projects on them to share with the class. Bobbie and Bob Cat can teach students a very important lesson that they will hopefully remember for the rest of their lives. I would highly recommend reading this book in the beginning of third grade in order to help students make that transition into the upper grades as well as learning how to make life-long friendships. Hurricane Katrina was a devastating storm that caused a lot of animals to have to be left behind by the families who needed to immediately evacuate their houses. Bobbie and Bob Cat were two of those animals who were left behind by their families. When volunteers went around looking for abandoned animals to pick up, they did not notice these two, therefore they were left to fight for survival on their own. Bobbie is a dog and Bob cat is a cat which is a very unique pair. Their friendship caused their survival to occur because Bob Cat was blind and Bobbie was his seeing dog. In the end, the pair end up being rescued by a construction worker who then takes them to a sanctuary. The pair was adopted by a nice lady with another dog and they became one big, happy family. 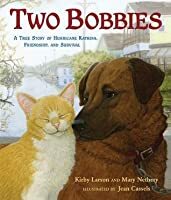 Two Bobbies: A True Story of Hurricane Katrina, Friendship and Survival, is definitely a tear jerker that reveals a friendship amongst a cat and dog that are inseparable. Based upon actually events, as Hurricane Katrina destroyed New Orleans these two pets embark on a journey for a new home after their family leaves them in the ruins. Bobbi is the protector over Bobbi the cat leading Bobbi to safety due to blindness eventually they are discovered after being sent away from a construction site and shelter, even shown on CNN which leads them to their new family. Kirby Larson and Mary Nethery gives an insight look at the journey of the two animals, showing realistic illustrations depicting images of New Orleans after the storm and descriptive details showing the characteristics of each animal. Jean Cassels (illustrator) used plenty of soft colors demonstrating the features of the two Bobbies! This would be a great picture book for kindergarten to 3rd grade featuring large colorful pictures that would capture the eye of any child. I would recommend this book for k-3rd grade, it displays a valuable lesson about friendship that should be taught in classroom. As students enter each grade they will start to make friends it’s important to let them know about having friendly relationships that can develop into life-long friendships. This story also shows a different side of Hurricane Katrina from a humane sense, Hurricane Katrina effected millions, and it would be a good idea to talk about how natural disasters happen and how people/animals can be effected. Kirby Larson went from history-phobe to history fanatic while writing the 2007 Newbery Honor Book, HATTIE BIG SKY. Her passion for historical fiction is reflected in titles such as THE FENCES BETWEEN US, THE FRIENDSHIP DOLL, as well as the sequel to HATTIE BIG SKY, HATTIE EVER AFTER, and her two latest titles, DUKE--which was nominated for 5 state Young Reader Choice awards as well as being a fina Kirby Larson went from history-phobe to history fanatic while writing the 2007 Newbery Honor Book, HATTIE BIG SKY. Her passion for historical fiction is reflected in titles such as THE FENCES BETWEEN US, THE FRIENDSHIP DOLL, as well as the sequel to HATTIE BIG SKY, HATTIE EVER AFTER, and her two latest titles, DUKE--which was nominated for 5 state Young Reader Choice awards as well as being a finalist for the Washington State Book Award-- and DASH--which has garnered two starred reviews, a NAPPA Gold Award and a Capitol Choices nomination. She will have two new books out in 2016 -- watch for them!